The munchkin is often described as a character or spirited. To meet her you would say the same, she really doesn’t shut up and has a fantastic sense of humour! In front of her peers, it’s a completely different story. Often painfully shy, she worries about what other kids will say, about getting something wrong and whether people will laugh at her. She’s hesitant to go to school dressed up, just in case, is very conscious about whether she is wearing or doing the right thing and struggles to join in at parties with kids she doesn’t know. We’re still not sure where she gets these worries from. Me and Mr C don’t really put her off doing or trying anything, we encourage her individuality and try to build her confidence, we tell her that as long as she’s happy she shouldn’t worry, it’s still sometimes difficult. I often wonder what goes through her 5yo mind! 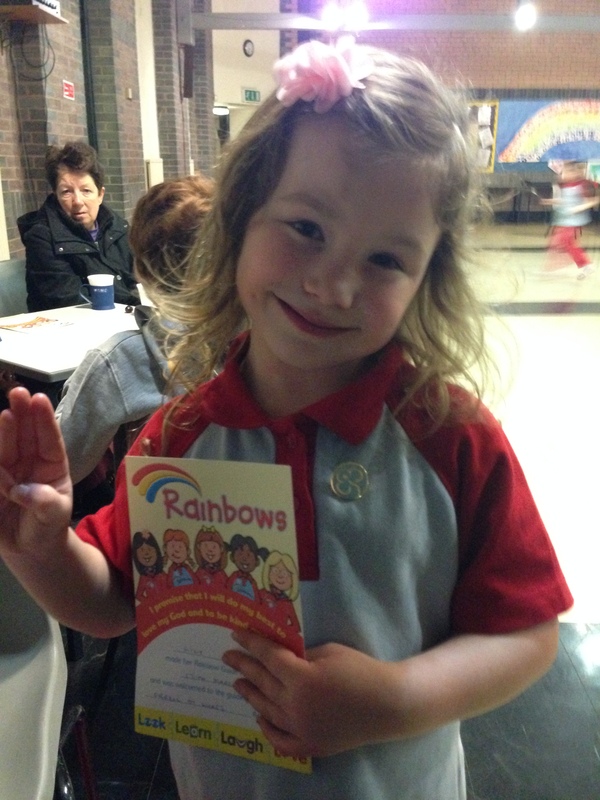 In September she started to attend the local Rainbows group. I wanted something that might help her in a group setting, with other children that didn’t go to her school. I had spoken to the leaders beforehand to explain that she was shy in groups, they were great, they weren’t going to push her and would let her join in when she wanted. The 1st few weeks there she wouldn’t join in the circle at the beginning or end of the session and wouldn’t tell people her name. She’s improved and has grown in confidence as she has got to know people. On Monday the little group were doing their Rainbow promise. She has been practicing the last couple of weeks and knew what she had to say off by heart! We all did! She was so excited that she would say it and then get a badge and a ‘tificate’. Parents were invited to watch and this started to worry her a little. I told her if started to feel shy to just look at mummy and daddy and then it would be just like saying her promise at home. We still weren’t sure if she would go through with it in front of everybody. We had nothing to worry about. 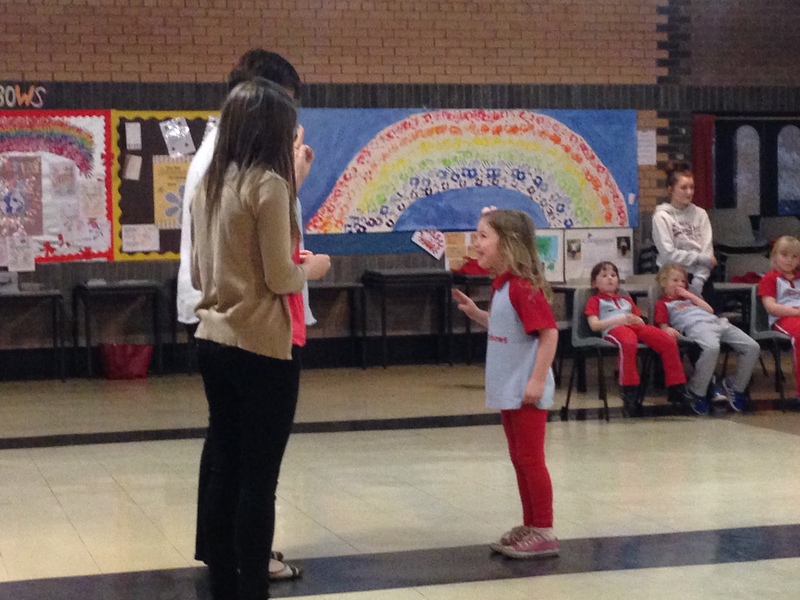 She skipped up to say her promise without faltering, she did a little jump (she’s a bit like zebedee when she’s excited) when she got her badge and giggled all the way back to sitting down. I’m not sure if filling up at her doing her little promise is normal, I’m blaming the pregnancy hormones! I was so proud, she has gone from not saying her name to standing up in front of people and speaking by herself! She was very proud of herself too! It had done her to world of good, I didn’t attend anything like that but it was important for me to get her involved. I knew she would love it! Filling up at stuff like this is TOTALLY normal! Trust me, it gets worse! She sounds like this is just the first step on her road to confidence – well done little lady 🙂 Thanks for linking up to #loudnproud.